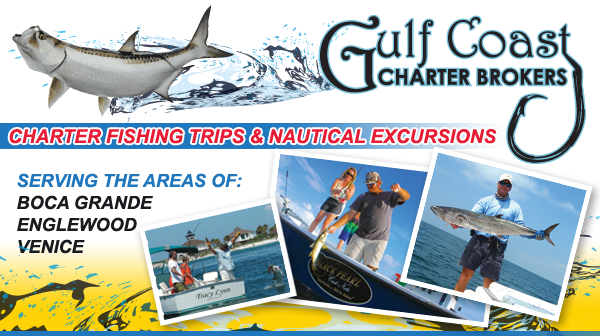 Gulf Coast Charter Brokers represents many of the finest guides in area waters! Many of our Captains are 3rd and 4th generation Florida fishermen with years of experience in Boca Grande and Charlotte Harbor waters. From the complete novice, to the professional fisherman, we invite you to come to the Gulf Coast of Florida to experience our world-class fishery. Our licensed Captains provide all equipment, bait, and licenses for your trip. All you need to do is pick up the phone and schedule your charter! Let us match you up with the perfect guide! Tell us the date you'd like to fish, how many in your party, and any special needs you may have, and we will find a Captain and boat that can accommodate you. Follow us on Facebook to see more photos, and read about what's happening in Boca Grande Pass, Englewood, and Venice!